David Cameron has said Britain is prepared to send a "sizeable amount" of troops in support of French forces battling Islamist militias in Mali. David Cameron has said Britain is prepared to send a “sizeable amount” of troops in support of French forces battling Islamist militias in Mali. In a phone call on Sunday night, the prime minister told French President François Hollande that Britain was “keen” to provide further military assistance to the operation, with Downing Street sources suggesting Britain could dispatch 200 troops immediately if requested. 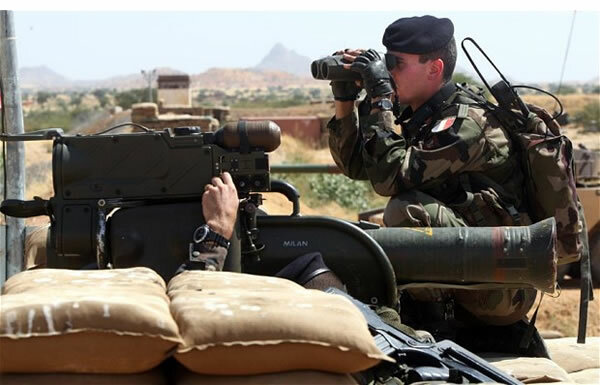 • Forming part of an EU military training mission in Mali. The British contribution to this would be in the “tens”, according to Downing Street. • Training troops from the Economic Community of West African States (Ecowas) in neighbouring countries for possible operations on Mali. This is likely to be the main focus of Britain’s contribution because Ecowas members include many countries with strong links to Britain. British troops could be used to train Nigerian forces. • Providing “force protection” for the trainers. This would be armed protection but would not amount to a combat role. Many major donors cut off funds to the country in March last year, when the Malian military orchestrated a coup in Bamako. This coup, labeled a response to insufficient government efforts to fight Mali’s civil war by its leaders, ultimately helped the various rebel factions cement their hold on the north of the country. On Monday, the African Union pledged $50 million to support the AFISMA force, with ECOWAS pledging $10 million as a group to be followed by further contributions from individual countries; Japan, meanwhile, has pledged an extra $120 million to stabilise the Sahel region, and Germany is to pledge $20 million, with the IMF providing an $18.4 million emergency loan to Mali. French forces yesterday liberated Timbuktu after the Islamist rebels burned thousands of its rarest treasures, torching the library of historic manuscripts, before fleeing into the desert. Why on earth is this being described as “good news” on the Left Foot Forward Facebook page?